A union representing 200,000 U.S. Postal Service employees reached a new, 40-month contract with the agency through an arbitrator on Friday, with covered career workers winning a 3.8 percent pay increase over the course of the agreement. Arbitrator Stephen Goldberg issued the contract after the American Postal Workers Union and USPS came to an impasse on negotiations last year. The union won a series of new rights and benefits for non-career workers, and protected the benefits of regular, full-time employees the Postal Service had previously threatened. The contract is retroactive to May 21 and will last through Sept. 20, 2018. APWU successfully fought off USPS proposals to create a new class of career employees compensated at a lower pay rate and the elimination of cost-of-living adjustments. The arbitrator also preserved layoff protections for career employees with at least six years experience, despite postal management’s efforts to relax those provisions. Goldberg also expanded the layoff protections to include all career employees on board as of July 8, 2016, including those who had not yet passed the six-year threshold. Career employees will receive a 1.2 percent pay raise retroactive to November 2015, and an additional 1.3 percent pay in the same month of both 2016 and 2017. Non-career postal support employees, who USPS has increasingly relied upon as it has shed labor costs, will receive a 6.8 percent pay increase over the course of the contract. PSEs do not receive COLAs, but will receive an additional 50 cents of pay per hour by 2017. In a significant development, the arbitrator placed a moratorium on plant closures until April 2017. 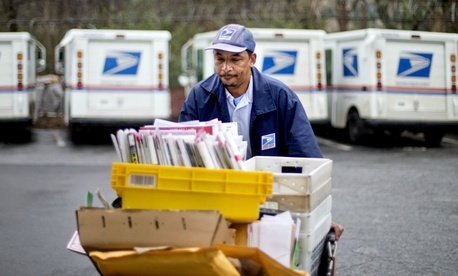 The Postal Service indefinitely delayed consolidations scheduled for 2015 after shuttering 141 facilities beginning in 2012. The second phase of the closures was set to cut thousands of jobs and relocate many more. The Postal Service must still justify the closures if it plans to move forward with them next year. In a victory for the Postal Service, APWU employees will pay 1 percent more per year for each of the next three years toward their health insurance premiums. Despite the setback, APWU President Mark Dimondstein praised the new collective bargaining agreement. The agreement will convert all PSEs working in maintenance or motor vehicle services to career employees within 60 days. The remaining non-career employees will for the first time receive six paid holidays and an annual uniform allowance, and the contract will streamline the process for USPS to convert those employees into career workers. The uniform perk for career employees will increase by 10 percent over the life of the contract. Darlene Casey, a USPS spokeswoman, declined to offer the agency's reaction to the new contract, saying it is "evaluating the award." She added the arbitration was the "result of a legally mandated binding arbitration process that is required when the parties reach impasse." The full details of the new contract are available here.